"Tussauds" redirects here. For the company, see The Tussauds Group. Madame Tussauds (UK: /tjuːˈsɔːdz/, US: /tuːˈsoʊz/)[N. 1] is a wax museum in London; it has smaller museums in a number of other major cities. It was founded by wax sculptor Marie Tussaud. It used to be spelled as "Madame Tussaud's"; the apostrophe is no longer used. Madame Tussauds is a major tourist attraction in London, displaying the waxworks of famous and historical figures, as well as popular film and television characters. Marie Tussaud was born as Marie Grosholtz in 1761 in Strasbourg, France. Her mother worked for Dr. Philippe Curtius in Bern, Switzerland, who was a physician skilled in wax modeling. Curtius taught Tussaud the art of wax modelling beginning when she was a child. He moved to Paris and took his young apprentice, then only 6 years old, with him. Grosholtz created her first wax sculpture in 1777 of Voltaire. At the age of 17, she became the art tutor to Madame Elizabeth, the sister of King Louis XVI of France, at the Palace of Versailles. During the French Revolution, she was imprisoned for three months and awaiting execution, but was released after the intervention of an influential friend. Other famous people whom she modelled included Jean-Jacques Rousseau and Benjamin Franklin. During the Revolution, she made models of many prominent victims. Grosholtz inherited Dr. Curtius's vast collection of wax models following his death in 1794. For the next 33 years she travelled around Europe with a touring show from the collection. She married Francois Tussaud in 1795 and took his surname. She renamed her show as Madame Tussaud's. In 1802, she accepted an invitation from Paul Philidor, a magic lantern and phantasmagoria pioneer, to exhibit her work alongside his show at the Lyceum Theatre, London. She did not fare particularly well financially, with Philidor taking half of her profits. She was unable to return to France because of the Napoleonic Wars, so she traveled throughout Great Britain and Ireland exhibiting her collection. From 1831, she took a series of short leases on the upper floor of "Baker Street Bazaar" (on the west side of Baker Street, Dorset Street, and King Street). This site was later featured in the Druce-Portland case sequence of trials of 1898–1907. This became Tussaud's first permanent home in 1836. Poster for the Tussaud wax figures exhibition, Baker Street, London 1835. 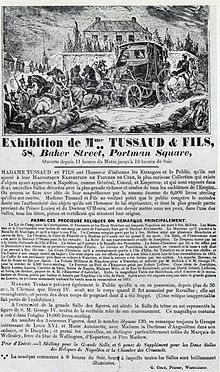 By 1835, Marie Tussaud had settled down in Baker Street, London and opened a museum. One of the main attractions of her museum was the Chamber of Horrors. The name is often credited to a contributor to Punch in 1845, but Tussaud appears to have originated it herself, using it in advertising as early as 1843. Some sculptures still exist that were made by Marie Tussaud herself. The gallery originally contained some 400 different figures, but fire damage in 1925, coupled with German bombs in 1941, severely damaged most of such older models. The casts themselves have survived, allowing the historical waxworks to be remade, and these can be seen in the museum's history exhibit. The oldest figure on display is that of Madame du Barry, the work of Curtius from 1765 and part of the waxworks left to Grosholtz at his death. Other faces from the time of Tussaud include Robespierre and George III. In 1842, she made a self-portrait, which is now on display at the entrance of her museum. She died in her sleep on 16 April 1850. By 1883, the restricted space and rising cost of the Baker Street site prompted her grandson Joseph Randall to commission construction of a building at the museum's current location on Marylebone Road. The new exhibition galleries were opened on 14 July 1884 and were a great success. But Randall had bought out his cousin Louisa's half share in the business in 1881, and that plus the building costs resulted in his having too little capital. He formed a limited company in 1888 to attract fresh capital but it had to be dissolved after disagreements between the family shareholders. In February 1889 Tussaud's was sold to a group of businessmen, led by Edwin Josiah Poyser. The first wax sculpture of a young Winston Churchill was made in 1908; a total of ten have been made since. The first overseas branch of Madame Tussauds was opened in Amsterdam in 1970. In 2005, Madame Tussauds was sold to a company in Dubai, Dubai International Capital, for £800m (US$1.5bn). In May 2007 Blackstone Group purchased The Tussauds Group from then-owner Dubai International Capital for US$1.9 billion; the company was merged with Blackstone's Merlin Entertainments and operation of Madame Tussauds was taken over by Merlin. After the Tussauds acquisition, Dubai International Capital gained 20% of Merlin Entertainment. The Tussauds Group as a separate entity ceased to exist. On 17 July 2007, as part of the financing for the Tussauds deal, Merlin sold the freehold of Madame Tussauds to private investor Nick Leslau and his investment firm Prestbury under a sale and leaseback agreement. Although the attraction sites are owned by Prestbury, they are operated by Merlin based on a renewable 35-year lease. Madame Tussaud's wax museum became a major tourist attraction in London. Until 2010 it incorporated the London Planetarium in its west wing. A large animated dark ride, The Spirit of London, opened in 1993. Today's wax figures at Tussauds include historical and royal figures, film stars, sports stars, and famous murderers. It has been known since 2007 as "Madame Tussauds" museums (no apostrophe). In July 2008, Madame Tussauds' Berlin branch became embroiled in controversy when a 41-year-old German man brushed past two guards and decapitated a wax figure depicting Adolf Hitler. This was believed to be an act of protest against showing the ruthless dictator alongside sports heroes, movie stars, and other historical figures. The statue has since been repaired, and the perpetrator has admitted that he attacked the statue to win a bet. The original model of Hitler was unveiled in Madame Tussauds London in April 1933; it was frequently vandalised and a 1936 replacement had to be carefully guarded. In January 2016, the statue of Adolf Hitler was removed from the London museum in response to an open letter sent by a staff writer of The Jewish Journal of Greater Los Angeles, followed by significant support for its removal from social media. The first Madame Tussauds in India opened in New Delhi on 1 December 2017. Its operator, Merlin Entertainments, planned an investment of 50 million pounds over the next 10 years. It features over 50 wax models, including political and entertainment figures such as Prime Minister Narendra Modi, Amitabh Bachchan, Salman Khan, Sachin Tendulkar, Kim Kardashian, Tom Cruise, Leonardo DiCaprio, Scarlett Johansson, Angelina Jolie, Asha Bhosle, Kapil Dev, and Mary Kom. Madame Tussauds in New York City opened in 2000. Madame Tussauds opened in Washington, D.C. in 2007. Madame Tussauds opened in Hollywood in 2009. Many times celebrities pose like their wax figures as pranks and publicity stunts. In 2010, Ozzy Osbourne did similarly in New York to promote his Scream (2010) album. In 2012, One Direction posed as their statues in the London museum, as a prank for the TV series Surprise Surprise. NBA players Carmelo Anthony and Jeremy Lin pranked fans during the unveiling of their statues at the New York and San Francisco museums, respectively. In 2015, Arnold Schwarzenegger posed as the Terminator statue in the Hollywood museum, to promote a charity event. Some sequences of the film Housefull 3 were shot in the Madame Tussauds, London. Parts of the film Fan (2016) were shot at Madame Tussauds, making it the first Indian film to be shot there. Madame Tussauds features in the film Shanghai Knights (2003). Marie Tussaud is featured in an Assassin's Creed Unity side mission, where the player is tasked with retrieving the severed heads of which Madame Tussaud was commissioned to make replicas. In Jules Verne novel Around the World in Eighty Days, his author says that the only thing the wax figures sculpted by Madame Tussaud lack is speech. In the novel Edgar Allan Poe and the London Monster (2016) by Karen Lee Street, Madame Tussaud meets twice with Edgar Allan Poe and C. Auguste Dupin at her exhibition halls. Madame Tussauds is the focus of Steve Taylor's song "Meltdown (at Madame Tussauds)", which describes someone turning up the thermostat and causing the wax figures to melt. Taylor wrote the song as "a new metaphor to ask [the] same question" as Jesus, "What good is it for a man to gain the whole world, yet forfeit his soul?" The Beatles had their wax figures featured along with cardboard cutouts of various famous people in the cover art for Sgt. Pepper's Lonely Hearts Club Band (1967). Several sculptures from the London branch ( including George Bush and Blair ) appear in the music video "Pop!ular" by singer-songwriter Darren Hayes. Marie Tussaud is mentioned in The Scarlet Pimpernel (first run on stage in 1903, first publication 1905). In 2015, the judges of NBC show America's Got Talent posed in the New York Madame Tussaud's location and led visitors to believe that they were part of a special display, when they were actually real people (Season 10, Episode 18). Madame Tussauds is mentioned in the American-British drama series Penny Dreadful (Season 2, Episode 1). Madame Tussauds is mentioned in episode 9 of Downton Abbey's 4th series as a possible destination for an outing for the servants following Lady Rose's coming out season. Spider-Man Will.i.am Tom Daley Martin Luther King Jr.
^ The family themselves pronounce it /ˈtuːsoʊ/. ^ Wells, John C. (2009). "Tussaud's". Longman Pronunciation Dictionary. London: Pearson Longman. ISBN 978-1-4058-8118-0. ^ Rothstein, Edward (24 August 2007). "Ripley's Believe It or Not – Madame Tussauds". The New York Times. Retrieved 12 May 2010. : "Madame Tussaud (who gave the attraction its now-jettisoned apostrophe) ..."
^ a b "The Baker Street Bazaar". 26 May 2012. ^ Du Plessis, Amelia. "England – Madame Tussauds". Informational site about England. Archived from the original on 13 December 2011. Retrieved 12 July 2011. ^ "Marie Tussaud Facts, information, pictures | Encyclopedia.com articles about Marie Tussaud". www.encyclopedia.com. Retrieved 28 March 2016. ^ Berridge, Kate...But now British actress Emma Watson is already to set and appear here... (2006). Madame Tussaud: A life in wax. New York: HarperCollins. ISBN 978-0-06-052847-8. ^ "Madame Tussauds' to open shop in Delhi – Times of India". ^ a b Cho, David (6 March 2007). "Blackstone Buys Madame Tussauds Chain". The Washington Post. ^ a b "Merlin conjures up leaseback deal". The Daily Telegraph. 17 July 2007. ^ "Tussauds firm bought in £1bn deal". BBC News. 5 March 2007. ^ "Alton Towers sold in £622m deal". BBC News. 17 July 2007. Retrieved 12 May 2010. ^ "Adolf Hitler returns to Berlin museum after beheading". meeja.com.au. 14 September 2008. Archived from the original on 19 September 2008. Retrieved 14 September 2008. ^ Carrel, Paul (5 July 2008). "Man rips head from Hitler wax figure". Reuters. ^ Gur-Arieh, Noga (6 January 2015). "Madame Tussauds Museum in London Removed Hitler Figure". The Jewish Journal of Greater Los Angeles. Retrieved 10 January 2016. ^ : "Madame Tussauds (no longer an apostrophe)." ^ "Madame Tussauds debuts in Delhi". BBC News. 1 December 2017. Retrieved 1 December 2017. ^ "Madame Tussauds Delhi to officially open for public on December 1". The Indian Express. 30 November 2017. Retrieved 1 December 2017. ^ "Take a sneak peek into India's first Madame Tussauds in Delhi – Wax figure of PM Narendra Modi". The Economic Times. ^ "Madame Tussauds Beijing" (in Chinese). madametussauds.com. Retrieved 4 May 2017. ^ "Madame Tussauds Chongqing" (in Chinese). madametussauds.com. Retrieved 4 May 2017. ^ "Madame Tussauds Shanghai" (in Chinese). madametussauds.com. Retrieved 4 May 2017. ^ "Madame Tussauds Wuhan" (in Chinese). madametussauds.com. Retrieved 4 May 2017. ^ "Madame Tussauds Hong Kong" (in Chinese). madametussauds.com. Retrieved 4 May 2017. ^ "Madame Tussauds Delhi". madametussauds.com. Retrieved 4 May 2017. ^ "Madame Tussauds Tokyo" (in Japanese). madametussauds.com. Retrieved 4 May 2017. ^ "Madame Tussauds Singapore". madametussauds.com. Retrieved 4 May 2017. ^ "Madame Tussauds Bangkok". madametussauds.com. Retrieved 4 May 2017. ^ "Madame Tussauds Amsterdam" (in Dutch). madametussauds.com. Retrieved 4 May 2017. ^ "Madame Tussauds Berlin" (in German). madametussauds.com. Retrieved 4 May 2017. ^ "Madame Tussauds Blackpool". madametussauds.com. Retrieved 4 May 2017. ^ "Madame Tussauds Istanbul" (in Turkish). madametussauds.com. Retrieved 4 May 2017. ^ "Madame Tussauds London". madametussauds.com. Retrieved 4 May 2017. ^ "Madame Tussauds Prague" (in Czech). madametussauds.com. Retrieved 4 May 2017. ^ "Madame Tussauds Vienna" (in German). madametussauds.com. Retrieved 4 May 2017. ^ "Madame Tussauds Holywood". madametussauds.com. Retrieved 4 May 2017. ^ "Madame Tussauds Las Vegas". madametussauds.com. Retrieved 4 May 2017. ^ "Madame Tussauds Nashville". madametussauds.com. Retrieved 4 May 2017. ^ "Madame Tussauds New York". madametussauds.com. Retrieved 4 May 2017. ^ "Madame Tussauds Orlando". madametussauds.com. Retrieved 4 May 2017. ^ "Madame Tussauds San Francisco". madametussauds.com. Retrieved 4 May 2017. ^ "Madame Tussauds Washington D.C." madametussauds.com. Retrieved 4 May 2017. ^ "Madame Tussauds Sydney". madametussauds.com. Retrieved 4 May 2017. ^ The Weather Channel (30 December 2009). "Al makes people jump out of their skin" – via YouTube. ^ "Carmelo Anthony Takes The Time To Prank Visitors at Madame Tussaud's " NBA.com – All Ball Blog with Lang Whitaker". National Basketball Association. ^ Pincus, Eric. "Jeremy Lin pranks at Madame Tussauds, pretends to be wax likeness". Los Angeles Times. ^ "Entertain This! – Daily hits and misses in pop culture". USA Today. ^ "Cloning Around With Steve Taylor". Todays Christian Music. Archived from the original on 12 March 2017. Retrieved 10 March 2017. ^ "Beatles waxworks sell for £81,500". BBC. 28 October 2005. ^ "Madame Tussauds™ London: One of London's Best Tourist Attractions". madametussauds.com. Retrieved 9 April 2018. ^ "EXO's Lay Meets His Wax Figure at Madame Tussauds in Beijing". ^ "List of Wax Figures". ^ "Wax Likeness of Supermodel Liu Wen Debuts at Madame Tussauds in Beijing". ^ "Madame Tussauds Blackpool". madametussauds.com. Retrieved 8 December 2016. ^ "Madame Tussauds New York – Celebrity Wax Attraction in Times Square". madametussauds.com. ^ Graphico. "Famous Wax Figures and icons – Madame Tussauds New York". madametussauds.com. McCallam, David (2002). "Waxing Revolutionary: Reflections on a Raid on a Waxworks at the Outbreak of the French Revolution". French History. 16 (2): 153–173. doi:10.1093/fh/16.2.153. .
Moran, Michelle (2011). Madame Tussaud: A Novel of the French Revolution. Crown. ISBN 0-307-58865-3. Pilbeam, Pamela (2006). Madame Tussaud: And the History of Waxworks. Continuum International Publishing Group. pp. 100–104. ISBN 1-85285-511-8.